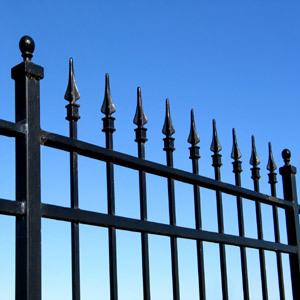 Steel ornamental fences are often confused with wrought iron and like the aluminum ornamental fencing, it’s hard to tell the difference between the two, but true wrought iron is a welded steel product that tends to be cost prohibitive as a backyard fence. Steel ornamental fence is available in a wide variety of sizes, styles, colors and grades to meet any need from residential to industrial with the advantage of being an affordable alternative to wrought iron while providing a maintenance free, rust proof fence. We use a product made in America by Ameristar. They offer a complete line of fence sizes, styles, and colors that includes decorative pedestrian and estate drive gates. The powder coated finish is scratch and chip resistant and has a manufacturer’s 20 year warranty. Call today or click on the “request a fence estimate” tab to set up your free, no obligation fence estimate. We will reply to your request promptly and get you started toward adding a beautiful Fox Fence to your property. WHAT FENCE STYLE ARE YOU LOOKING FOR?